Two main execution characteristics of angular services are that they are singleton and lazy instantiated. Angular only creates instance of a service when an application component depends on it. On the other hand each application component dependent on the service work with the single instance of the service created by the angular. Keep in mind that services are singleton object and gets instantiated once per angular app using the $injector and they gets created when angular app components need them. Further in the post we will talk about other options to create the service. Above we have created the calculator service using the service() method. To use the service in the controller, we are passing the service module CalculatorService as dependency in the application module. Next in the controller we are passing name of the service Calculator to be used. We can create a service using the factory as shown below. We are creating the service to reverse the string. Let us understand difference between creating a service using the service() method and the factory() method. If we want to register a service using the function constructor, in that scenario we will use service() method to register the service. If we use factory() method to register the service it returns the value after execution of the service function. It can return any value like primitive value, function or object. So service() method returns the function object whereas factory() method can return any kind of value. This post will not cover how to create a JSON based WCF REST Service. 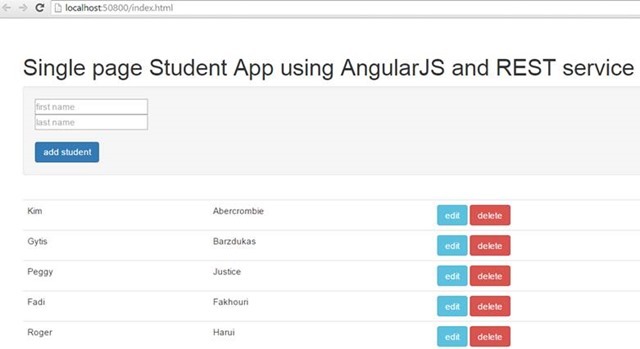 With the assumption that REST based service is already in place to retrieve the students and add a student, we will write the angular application. We are creating the service using the factory(). There are two methods in the service. getStudents fetch all the students using the $http.get whereas addStudent add a student using the $http.post. In the service we are using other inbuilt angular service $http to make the call to the service. To use the $http service, we have to pass this as dependency to the service factory() method. Once service is created, let us create the controller which will use the service to perform the operations. In the controller we are adding getStudents and addStudents functions to scope. As it is clear from the name that these functions are used to fetch students and add student respectively. As a dependency StudentSevice module is passed in the module and in the controller we are passing the StudentDataOp service as the dependency. Other important thing to notice is that, we are creating student object to be added using the $scope object properties like fname and lname. These properties are set to the $scope on the view. View is very simple. StudentController is attached to the view. There are two section in the view. In first section we are taking user input to create the student. In the second section, in a table all the students are listed. In the input form we are setting fname and lname properties on the $scope object and then calling addStudent() function of the controller to add a student to the database. In the table using the ng-repeat directive all the students are listed. We have put two buttons for edit and delete. These buttons are not performing any task as of yet. In further posts we will add edit, delete and search functionality. If you are following along the posts, may be you want to these functionality of your own and share experience with me. On running the application, you will get form to add a student and all students listed in the table. This is how you can create and use angularJS service in application. I hope you find this post useful. Thanks for reading. Happy coding. What about thousands of record rendering from SharePoint lists? What should be the best way? Can you please provide me any solution on that? What about rendering 50K records into ng-grid? Is it possible to render thousands of records from SharePoint List (Created using BCS as external list). Can you provide me the solution for that?